I’m just loving how many notable designers are combining a bohemian mix of items in an UNdecorated feel…surrounding themselves with pieces they truly love. Those of you who know me are aware of my tremendous LOVE for antiques and vintage furnishings from all eras. And that my passion for visiting historic sites and architectural gems is so powerful! I often drag my wonderful fourteen year old son, Grady, around with me (he really does have fun and we enjoy spending the time together). 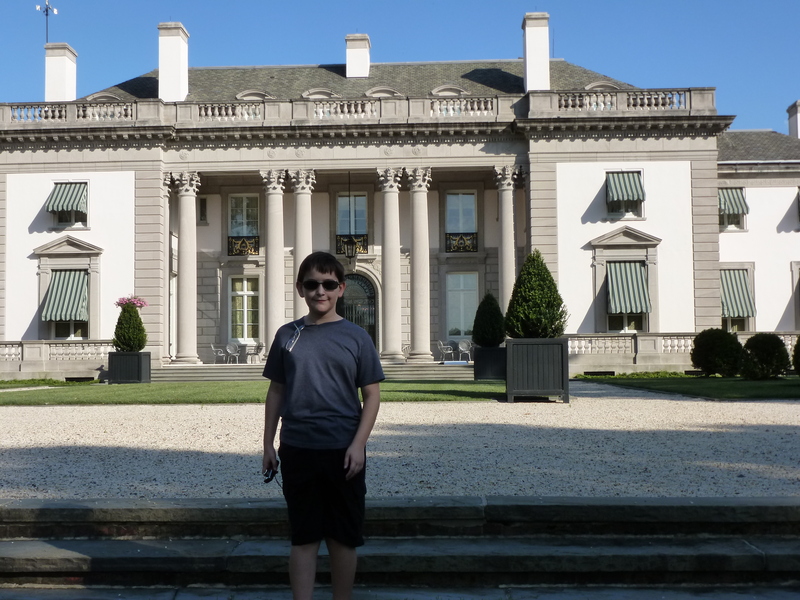 My son, Grady, in front of Nemours: the Dupont Mansion in Delaware. Just one of the many fabulous historic sites we’ve visited together. These frequent excursions to historic sites and my own love for antiques and vintage furnishings have definitely influenced my design work over the years. This look was, in part, my inspiration for my recent Bucks County Designer House sunroom project. A wonderfully collected eclectic and colorful room by Todd Alexander Romano found on Pinterest. A colorful pink sofa with a large mirror used behind it is very similar to the statement pieces in my Bucks County Designer House sunroom. It takes courage, and flair to implement this look, but the style is so truly energizing, free…and edgy. I just love it! So I’m sharing here, today, some of my favorite designers who are masters at this style. The first is Windsor Smith, an A-list designer from Los Angeles, CA. 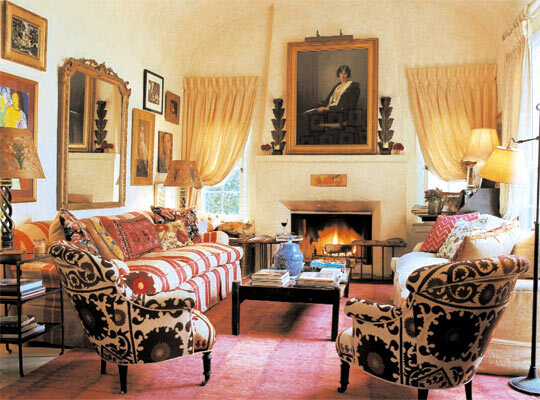 A very bold color scheme is used here by Windsor Smith, using Vintage, Antiques, and Ethnic pieces. Another famous designer who is known for this look is Kathryn Ireland. Designer Kathryn Ireland uses a wide variety of ethnic fabrics and fine antiques to create her own unique style with bold colors and strong patterns. Recently featured on Elle Décor is Alex Papachristidis’ home with wild pattern and color. 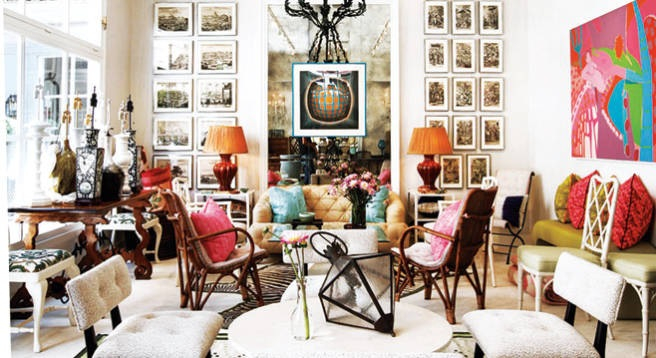 Another A-list designer, Alex Papachristidis, uses an exotic mix of antiques, pattern and bold color in his own home. Not everyone embraces this courageous style, but one can appreciate the fearless quality and sense of curated high-fashion that it evokes. What do you think of this current trend in the design world…do you crave some Boho Chic as well? Make sure you take the time to post a comment and let me know what you think about this post. I LOVE to hear from you! This entry was posted in Antiques, Decorating, Historic Sites, Home Decor, Interior Design and tagged accessories, Bucks County Designer House, Decor, Decorating, Eclectic, Fearlessly, Furnishings, Furniture, Interior Designer, Vintage. Bookmark the permalink. Sigh. Just want to order a big skip and start again. All looks so stylish and elegant. No stuff or clutter. One day….